Hi, what is this letter all about ? I see it occasionally, after ζ i think and can't find out why it's still used sometimes ? It's hard to guess what exactly you saw, but I suspect that you encountered some medieval-style inscription. In Byzantium a lot of so called ligatures were used (multiple letters combined into single one). I saw a lot of such inscriptions on Greek orthodox icons and in some printed ecclesiastic books. Stigma represents the numerical value of ancient digamma, an obsolete letter from the first Greek alphabet. Digamma followed ε and preceded ζ in the original alphabet, that is, it was the sixth letter, so its numeric value was 6. Digamma was soon dropped from use in writing sounds, but its use as a written number continued for many centuries. In early medieval times, ligatured lunate CT (for Greek στίγμα) replaced the ancient symbol for digamma, although στίγμα in contemporary use is written as ΣΤ' in uppercase and as στ΄ or ς' in lowercase. However, στίγμα is now normally used only as the "alphabetic" ordinal for the number 6; that is, it now represents any inflected form of έκτος. For a little more about the role and value of στίγμα, see Addendum II (FYI: ordinals in "alphabetic" form) of "FYI: ordinals" in Discussion Forum 23. And if you're interested in the historical derivation and development of stigma, there's a good article in Wikipedia: Stigma (letter). Hi again, thanks for the link to Wikipedia and for your assistance. 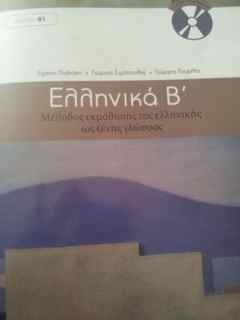 I understand where the letter comes from but why it is still used in the course book we are using at Leeds University for Greek Advanced level (up to degree level) is a mystery. I attach a couple of photos with one showing its inexplicable (to me) appearance. When I asked the (Greek ,native speaker) tutor about it, she offered no satisfactory explanation, and my fellow pupils either didn't care or just dismissed it with a " 'cos it's GREEK!" remark. I. however, was not satisfied and so I looked to Greg (or anyone else on here) for clarification as someone always seems to have the answer, going right back to my early days on LGO which got me hooked on this language. 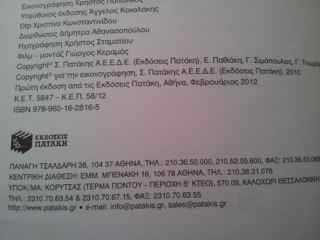 .........and this is the publication responsible! .......and here is the publisher! The στ. (stigma) in your photo is the Greek "alphabetic" (non-Arabic) numeral for 6. These "alphabetic" numerals are commonly used everyday exactly as in the photo, i.e., in an ordered list of items, topics, or paragraphs. Thus, in the first photo that you include, I can see "alphabetic" α. 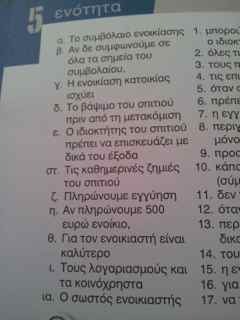 (1) thru "alphabetic" ια. (11). These numerals are normally seen with an ancient ΄ mark following them indicating that the letter is being used as its numerical value (α΄= 1, β΄= 2, γ΄= 3, δ΄= 4, ε΄= 5, στ΄or ς΄= 6, ζ΄= 7, ...), but the mark is sometimes stylistically omitted as understood, and that appears from the photo to be the case in your book, where I cannot see any ΄ marks, and the letters are followed by a period. I assumed that Addendum II to "FYI: ordinals" in Discussion Forum 23 which I mentioned before would satisfactorily explain all this, but perhaps not. If you need more, let me know. Hi Greg! Thank You! If only I had looked at DF 23 "FYI: ordinals" everything would have been clear! You explain clearly and comprehensively the whole matter. Now I see that the letters represent ordinal numbers and why they were used(because Arab numerals weren't around), the only odd thing (to me) is that they continue to be used? I am so grateful for your assistance, and to think, I looked at lesson 23 and its discussion forum some 2 or 3 years ago; not closely enough,obviously! Greek "alphabetic" numerals continue to be used today because Greeks as a whole are very proud of their ancient past -- they venerate and identify with anything and everything associated with it and are very loathe to discard anything from that era. The Greek way of writing numerals, even though now restricted to ordinal use, is part of that tradition and simply will not be jettisoned completely in favor of "foreign" Arabic ordinals, especially in educated, formal, or academic use. A total replacement of the Greek "alphabetic" ordinals with the now nearly globally-standard Arabic ordinals would be perceived and felt as a betrayal of their ancient culture, so the two live side-by-side in contemporary use. Hi again Greg, I am very pleased to know that. I have no problem with that, in fact I find it laudable and extremely refreshing. I am of the opinion that Greece is losing (has lost) quite a bit of its "Greekness" in the 30 years since I first visited. The EEC and the Euro being partly responsible I guess. Of course, I can only speak as a tourist but there seems to be a homogeneity among the resorts and even lesser-known destinations. Never get invited into the kitchen to see what's cooking, the ferries have escalators, buses run bang on time, I suppose one shouldn't live in the past and I still adore the country and always will. Long may they hold on to everything that is traditional and that includes alphabetical/numerical 'eccentricities' . I even dislike the STOP signs in English! The names of roads being in English as well as Greek used to discourage me from attempting to pronounce them but I am better at that now. One day I hope to be able to compose a similar missive to this entirely in Greek; that day is I fear,a long way off yet.